At your last trade show, did you struggle with your cell phone constantly dying? If not, you are a true anomaly! Would you also email me with your cell phone provider, and style? When you attend a trade show for business you have the responsibility of working the floor, or walking the floor. You are constantly in motion, so most outside business is done on a cell phone. For that reason, it is pretty standard for your phone to be dead before the day is finished. You will eventually have to spend time finding a random outlet to plug into. With your luck the outlet will be in the furthest, darkest, and most inconvenient back corner of the trade show hall. You will then have to stand there for about 20 minutes waiting on the phone to charge. Awkwardly trying to check your email from a standing position, even though the cord doesn't reach far enough. And stressed because your trade show coordinator is pressuring you to get back to the booth, and clients are awaiting your response. This can be a frustrating & repetitive cycle that lasts the duration of the trade show. I am here to tell you that this is not only frustrating, but also unnecessary. I am excited to introduce you to our new charging bistro stations that include several USB ports. 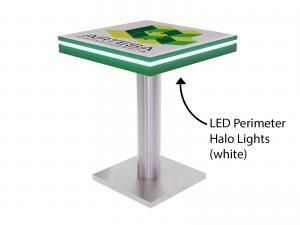 The charging station can easily be integrated into your trade show display plan. Imagine if you never had to worry about a dead cell phone again, or the mental exhaustion involved in finding that lone outlet at the show. Instead, you could plug your phone in, inside the booth. The charging station is beneficial to trade show exhibitors, as well as trade show attendees. It will draw dead cell phone users from all over the show floor. Not only that, charging stations attract attention and are a popular convenience for potential and existing clients. You would be benefiting, and so would your attendees overall trade show experience. Our designers also wanted to make the charging bistro station eye catching, so they incorporated our LED Perimeter halo lights. You can select a variety of different colors, and it makes the table stand out even more effectively. Most of our charging stations are modular, meaning they disassemble for shipping. Take a look at our Charging Bistro Station options. If for some reason you don't see exactly what you want, we specialize in designing and building workstations and kiosks that meet any need. We will help you find that right fit for your trade show display presentation.